We are committed to your and your family’s wellbeing. We are a leading company in accident and cancer insurance in Puerto Rico; a local business established 60 years ago to serve our people. Our clients are important to us and we understand their needs. That is what sets us apart from other insurance companies. Another difference is our solid commitment to offer the most comprehensive insurance products. We are also at the cutting edge of our industry, providing flexible products tailored to your needs. We want to help you deal with any unexpected situation, providing you peace of mind by knowing that you and your family are protected. We are proud to gain your trust and we are determined to serve you. You are part of our family. We have the experience, reputation and financial strength to support you, as demonstrated by our qualifications. The oldest and most widely recognized provider of ratings, with a mission of reporting on the financial stability of insurance companies. 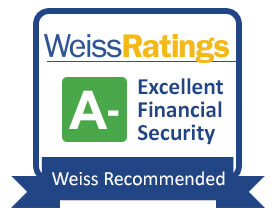 The most accurate, impartial and safe source of ratings, as it is the only 100% independent rating agency in the United States. A non-profit corporation that uses an Accredited Business system to assign classifications of creating a community of reliable companies.